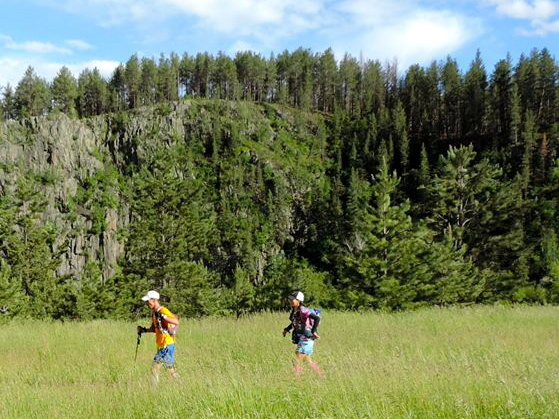 Kurt’s GoPro footage of the first 50 miles of the 2014 Black Hills 100. Shows the sticky mud, stream crossings and varied terrain accompanied by his entertaining commentary. 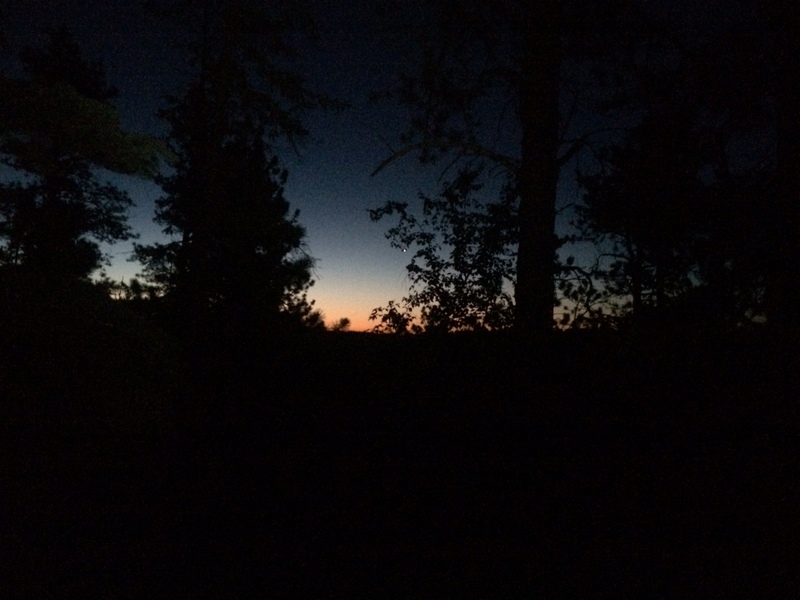 If you don’t want to read the whole report, here’s the quick and dirty version of crewing/pacing Kurt at the Black Hills 100 2014 in two paragraphs. This is a scenic but difficult course, made even more challenging because of the mud (that’s the dirty part). Kurt trained well doing lots of hill work and several self-supported 30-45 milers. Three things that kept him going: Spiz, Energybits and Rock tape. Three things that made the race more challenging: nausea of an unknown cause, too much caffeine and muddy trails torn up by ATVs(what one guy called aptly called “feces hill”). 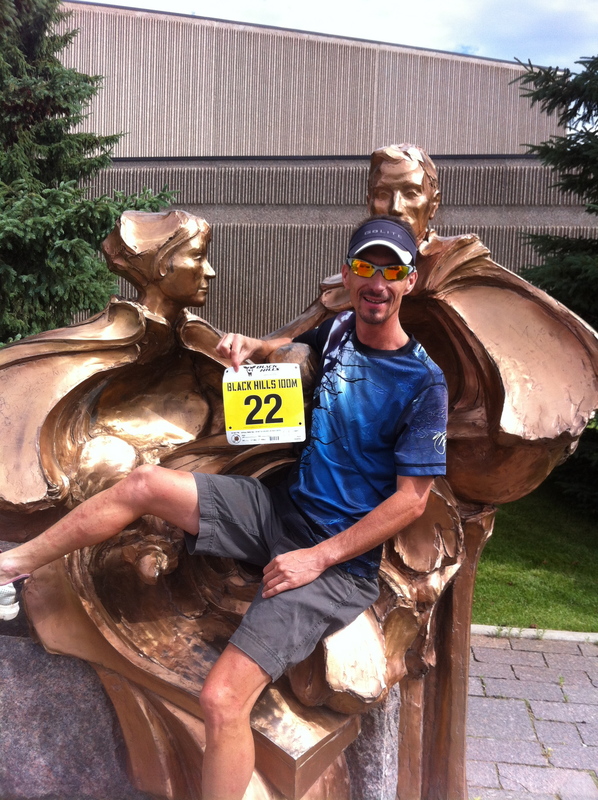 With sore feet and a sick stomach Kurt was incredibly tough and made it to the finish line in 30:34. 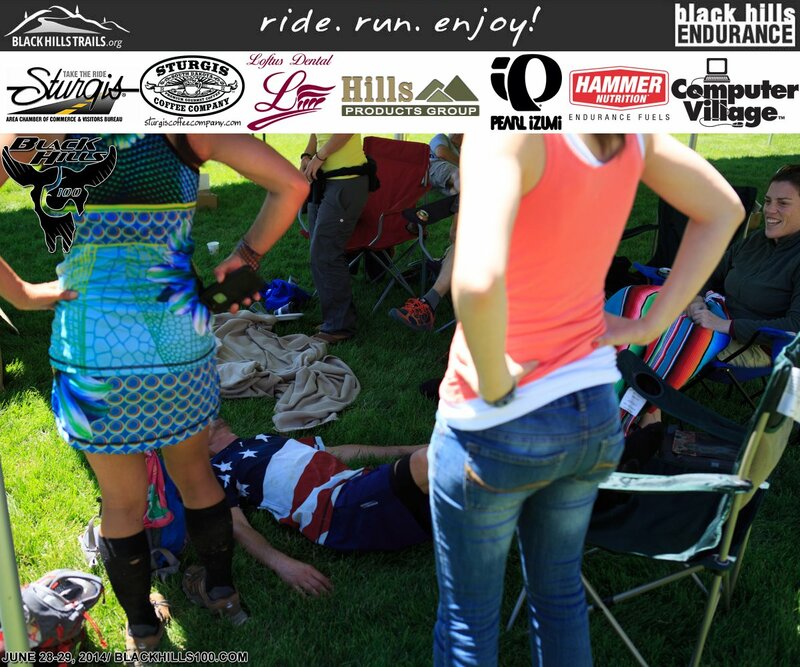 If you are going to an ultra to crew or pace someone, here are a few tips. Meet as many people as you can, it makes the race more memorable. Being a bossy pacer is a necessary evil to get your runner to the finish. Keep note of as much as you can because more than likely your runner won’t remember it all. 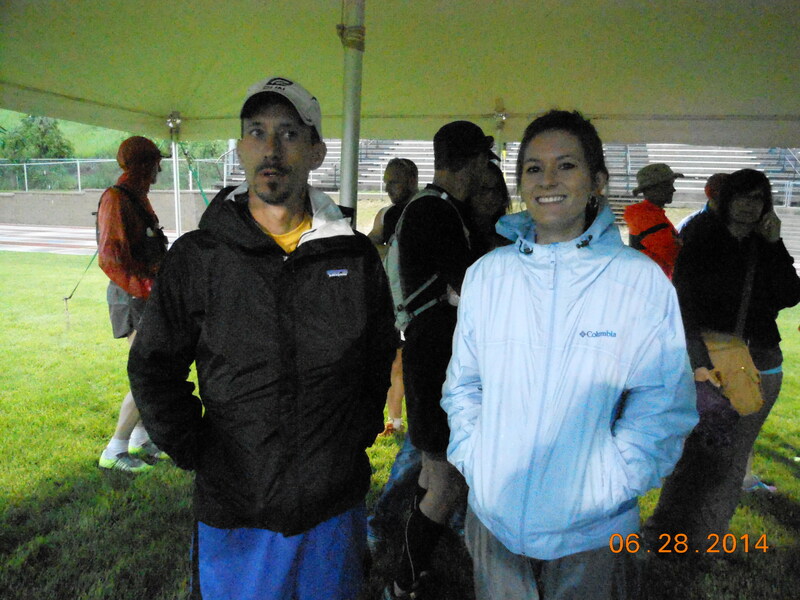 No matter how tired you or your runner is, take LOTS of finish line pictures. When you read race reports most are written from the viewpoint of the runner, which is one part of the race story. But while the runners are toiling on the course, the crews and pacers are experiencing a different part of the race. The planning, driving, waiting, worrying and mad dash when the runner finally arrives is a whole different experience. While I have crewed and paced for several ultras, this was the first time I was “head honcho” crew person and pacer, the one in charge of all the details. For the first half I’d be crewing with Kurt’s daughter, Jenice and parents Ken and Nancy. For the second half I’d be pacing while they crewed us only at the final two aid stations. Although the overall outcome was a success there is much room for improvement. Kurt’s leg after just 5 minutes checking out the trail. 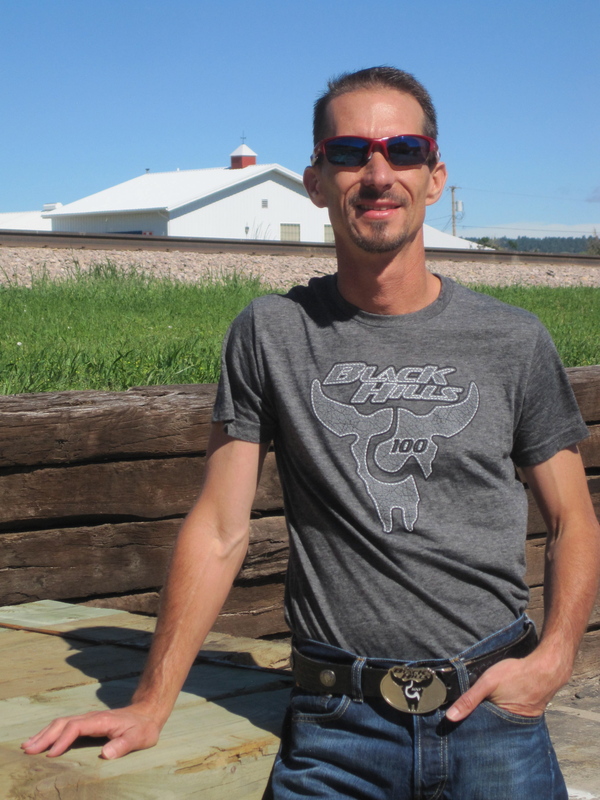 We were fortunate to arrive in Sturgis, South Dakota two days before the race. This gave us time to scout out the course, worry about the endless pouring rain and flood warnings, wander around the town, and relax before the mad stress of the race began. Scouting the course and aid stations was a huge benefit because it gave me confidence finding each station and we discovered Kurt was highly allergic to the weeds and grasses that lined the trails. Crew tip #1 Always double check race schedule, no matter what the runner says. I failed to do this for the pre-race meeting and we arrived just as the meeting was ending. Luckily the race director was still available and he gave us the 5 minute run down on the important points of the meeting, basically the course is muddy (a true understatement), the stream crossings are deep (also an understatement) and don’t go down a trail that is marked with a red “W”. In the grand scheme of the race, missing the meeting wasn’t a big deal but it definitely added to Kurt’s stress level. We all tried to reassure him that he had all the information he needed. I’m not sure he bought it but he tried to let it go. At 2AM, 3AM and 4AM we awoke to the sound of rain pouring off the hotel roof. So much for Kurt’s heat training…I was thinking, anyone who cross-trained by swimming would be in good shape. Kurt did all his pre-race preparations, and we headed to check in. At the start the rain started to let up! We chatted with other runners (Ed, Julia and Cat). In addition to the 100 mile race there was also a 100k, 50m and bike race going on simultaneously. Like most of the runners, Kurt was nervous and just wanted to run but he let us take a few pictures before lining up. Finally, the race started and all the runners and crews scattered. From a crewing standpoint, this race is extremely easy (not so much from a running standpoint, but more on that later) and scenic. Because Kurt had done so many self-supported long runs he didn’t need us to meet him at the 5 miles, giving us 3 hours to wait. I discovered that when you are running, 3 hours flies by. When you are waiting to meet your runner, 3 hours seems endless. 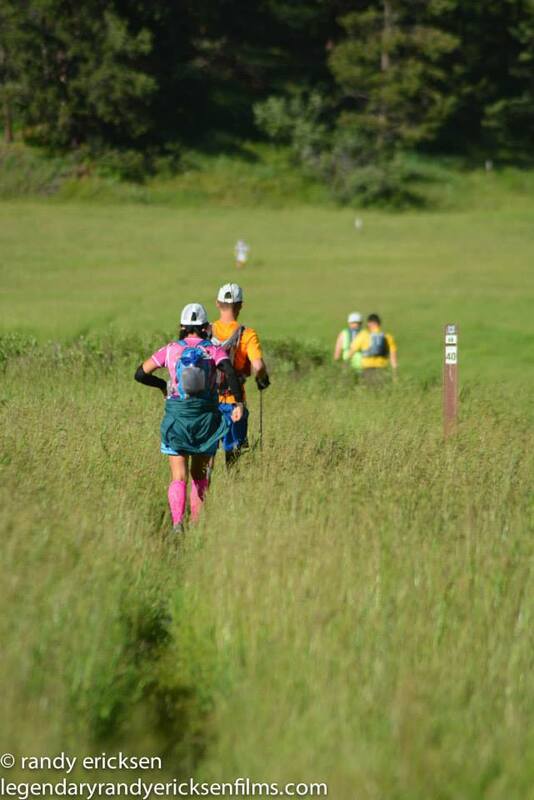 With cars packed with all Kurt’s clothing and supplies and enough snacks and food for our day, we headed out to mile 17 Elk Creek. Other crews informed us that only a handful of runners had come through, only one of them being a 100 miler. Jenice and Kurt’s mom, Nancy and I were all nervous, pacing around by the aid station. Ken, Kurt’s dad headed across the road to find a good spot to take pictures as Kurt came down the trail. Each runner who emerged from the trail was covered in mud up to the knees. Ed Thomas came through in 4th place and looking fresh and happy. It was good to have the distraction of helping him and meeting his crew. Kurt arrived looking cheerful but said his stomach felt a “little off”. He’d eaten a little but mainly wanted Spiz, coke and potato chips. He also took some Energybits. He said the mud was taxing the legs but overall everything seemed to be going well. The next section had the stream crossings and one remote aid station. Relieved that things were rolling along well, we were off to mile 29, Dalton Lake. At Dalton Lake we had a lot of time to meet other crews and find out about their runners. 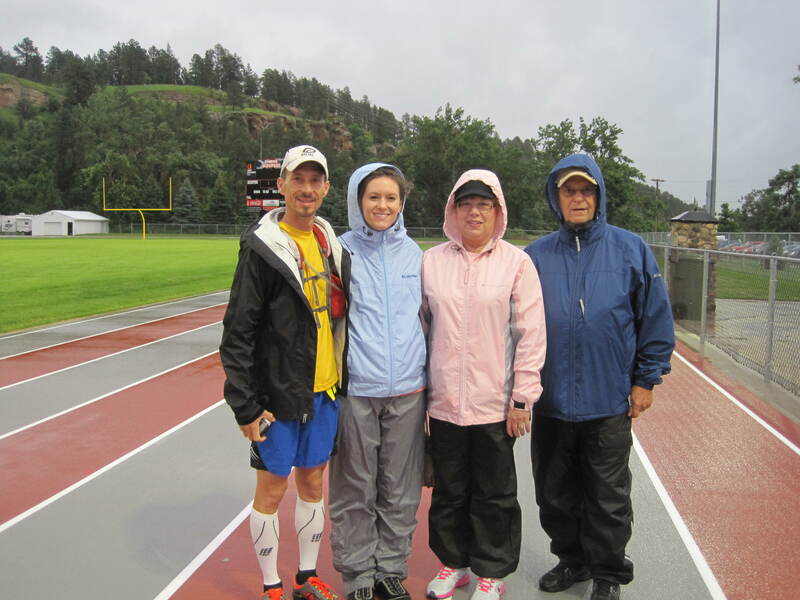 It seemed there were a lot of runners from Colorado and Minnesota and everybody was extremely friendly. The crowds had thinned a little because the 50 milers had already turned around. Occasionally a mud-caked biker would emerge from the trail, looking as if he’d swum rather than ridden through the muck. We’d timed Kurt’s pace into Elk Creek and estimated when he’d arrive. As the time approached, the clouds moved in and it started to pour again. Jenice, Nancy and I ducked into the car while Ken braved the rain, not wanting to miss a picture opportunity. As if on cue, the rain stopped, Kurt arrived and the frenzy began. Of all of us, I’d say Kurt was the most calm and focused. 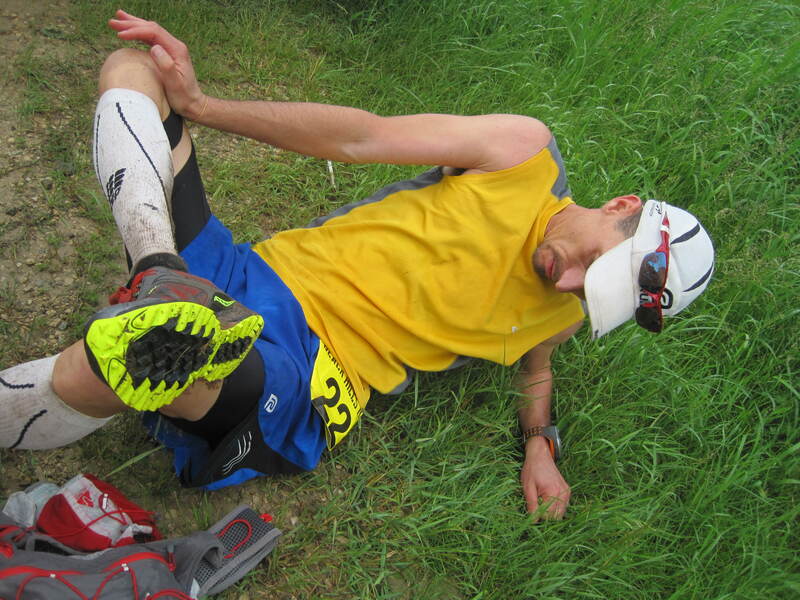 Using Rock Tape, he taped his knees to stabilize them in the muddy sections, refilled his Spiz and water, ate some chips, drank more coke and left smiling. We’d see him again in 7 miles. The next aid station, Nemo was a guest ranch complete with a general store, outhouses and horses. Kurt was keeping a steady pace and arrived on schedule. As he ran down the paved road toward us, I ran out to meet him. Without warning he grabbed me and gave me a big hug, saying he was glad to see me. Not expecting this show of emotion, initially I was worried that something was wrong but thankfully not. Because ultras are so physically taxing, they seem to bring your emotions to the surface without the ability to filter them effectively. Because so much mud had caked on his shoes Kurt decided to change shoes. He continued to take coke, Spiz, Energybits and a little chicken with stars soup. Not much changed at the next two aid stations, Pilot Knob and the 50 mile turnaround at Silver City. The rain seemed to be chasing us but strangely would dissipate every time Kurt arrived. His pace didn’t vary even though he wasn’t eating much. He was drinking a bottle of Spiz (about 300 calories) every 5-7 miles and still taking in Energybits and water. He also picked up his poles for the return trip. With the sun still shining and 12 hours into the race we headed out . We exchanged stories about the 50 previous miles. Even after “tossing his cookies”, Kurt was in good spirits. He filmed on the Gopro, posed for selfies, cursed a little at the steep hills. I was happy for the hills because honestly with the pace Kurt had kept for the first 50 miles I was worried whether I could keep up with him for the remainder of the race. I didn’t tell Kurt my worries but had told Jenice my concern. In this stretch we started to see other runners heading to the turnaround and this made the miles go quickly. As crews and runners do, we had given each runner a nickname. We saw Colorado Katie (the leading female), Annette from Minnesota (the 2nd female), Fort Collins Cat, Umstead Rhonda, who we high-fived as we passed. Back at Pilot Knob (57.5 miles) Kurt joked with the aid station volunteers as he tried to eat some watermelon and broth. I tried to push the quesadillas and grilled cheese but he wasn’t biting. He was still drinking a bottle of Spiz before every aid station and peeing every 90 or so minutes but his temperature was fluctuating quickly even as we ran. Once it was dark the threat of rain disappeared. The multitude of stars indicating a cloudless night made me blissful for more than one reason. Armed with headlamps and glow necklaces we trotted on. Our pace had slowed significantly from what Kurt had been running during the day and I fretted a little about letting Jenice, Nancy and Ken know about our progress. We didn’t have cell service and the race officials weren’t doing much tracking of runners. We had left the crew at 50 miles and weren’t going to see them again until mile 83. Our plan was to use drop bags and carry enough supplies to let them drive to town and sleep. 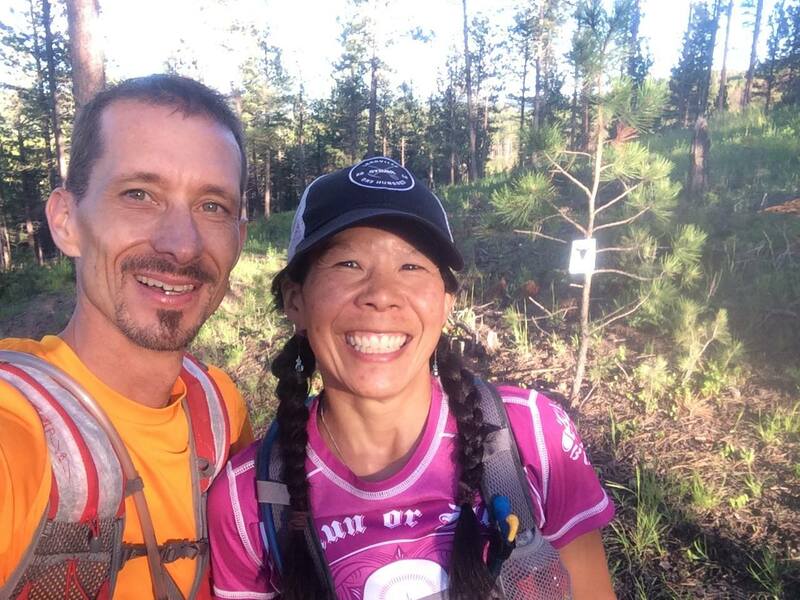 Being a meticulous crew person, Jenice had been calculating Kurt’s splits for each section and anticipated we would arrive at mile 82 in 6-7 hours. What I neglected to tell her was that night-time running after 50 miles can be much, much, much slower. I think I was optimistic that Kurt would not slow during the night. Crew tip #2 Warn anyone new to crewing for a 100-miler that a runner’s pace during the night can drop off 2-10 minutes/mile during the night. This is not necessarily a cause for concern and is very NORMAL . 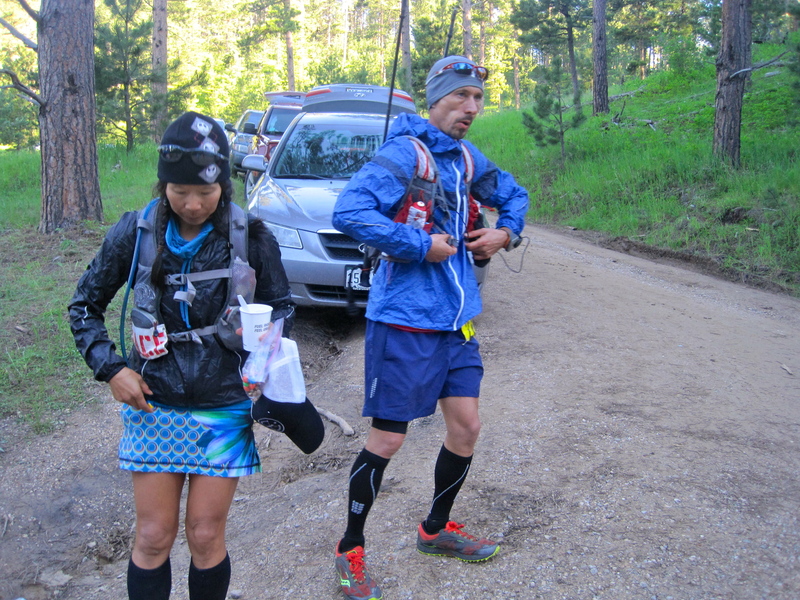 You still should arrive at aid stations early but be prepared for LONG waits. Approaching Nemo I texted Jenice our pace and time, uploaded pictures to FaceBook and asked Kurt what he needed. Standing at the aid station shivering he tried some more broth and coke, asked about other runners, ate a little watermelon and chips and we were off. The next stretches through the night were rough. We passed a few runners but the lack of real food was starting to take a toll on Kurt. He was consistently drinking coke, Spiz and Energybits but was avoiding many of the solid foods like bacon and olives that had trained with. He was still nauseous and occasionally still throwing up, sometimes to the point of having to kneel on the side of the trail. His body temperature was still off and so as we approached each aid station I’d tell him to put on his jacket and long sleeved shirt so he didn’t waste energy freezing as he ate and refilled his pack. I’d remix his Spiz, get him some potato chips and try to get him to eat anything. At one point I was a few steps ahead of and as I turned back to check on him, he stumbled and weaved like a drunken, crazy, old man. I grabbed his elbow and led him along, panicked that I needed to get him to wake up. As I later told Kurt, I had a glimpse of what Kurt would look like as an old man, hobbling along with a cane. (I will admit it was kind of cute, even under the bizarre circumstances.) I got him to eat one gel candy and put his ipod on. This seemed to do the trick. As his music played, Kurt started to run and wake up. I breathed a sigh of relief. After his 3rd or 4th extended bathroom break it dawned on me that Kurt’s problem might have been too much caffeine. When we got to the remote aid station I recommended he skip the coke and try ginger ale or a clear soda so he could get the sugar but not any caffeine. He complied and after this switch he thankfully stopped throwing up. As the sky started lightening our spirits lifted. Once his stomach stopped rebelling I knew Kurt would make it to the finish. 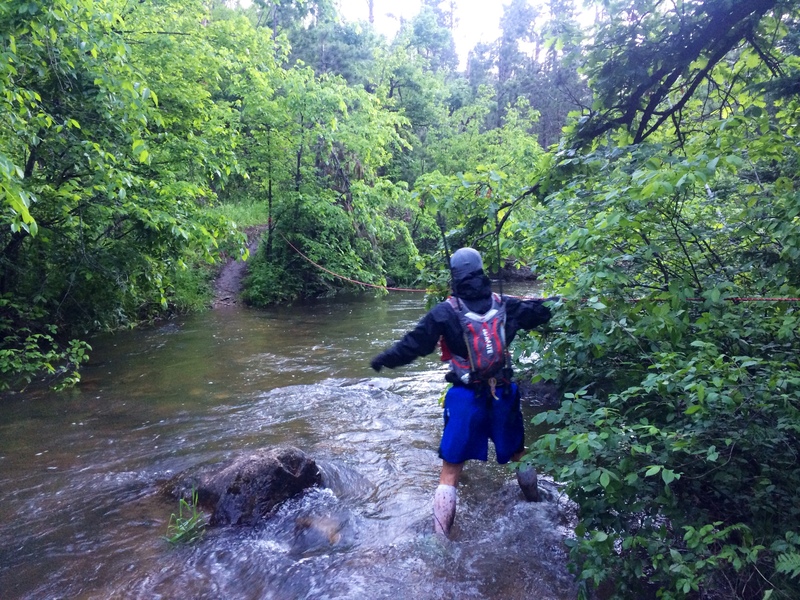 With enough time ahead of the cutoffs, his legs and feet functioning well and daylight approaching the one big obstacle was getting through the stream crossings and to the next aid station without Kurt’s body temperature plummeting. Not just worried about Kurt, I was concerned how my body would react to the cold and had been dreading this section all night. I was more than thankful we didn’t have to cross in the dark. The approach to the streams was incredibly beautiful. We were surrounded by lush greenery filled with birds welcoming the morning with song. We paralleled the water for about a mile before a crossing marked by a thin rope emerged. Kurt had the foresight to put on all his warm clothing plunging into the first hip-deep stream. Honestly, at the first crossing I had flashbacks to my first Leadville 100 where my feet were swept up from under me and only my death grip on the rope and the help of a search and rescue guy kept me from floating downstream. With a mixture of fear and fatigue I choked back some tears in the back of my throat. I was so glad Kurt didn’t realize how shaken I was. I took a solid step and carefully planted my feet, focusing on the bank ahead rather than the rushing water pushing my feet aside. Once across we walked in ankle deep water to the next few crossings. Once our feet were submerged the cold sensation disappeared. At the 4th crossing I was grateful I’d put my ipod up around my neck because I lost my footing and fell in! Since I was mostly wet and we were almost through all the streams it was comical. It made the 5th and deepest crossing seem less daunting. Trying to warm up and thinking about the joy of seeing the crew, Kurt and I motored on. I could tell he was on the brink of being cold, a dangerous place to be with 20 miles ahead of us. We both were thrilled to climb the hill to the aid station. We were greeted by hoots and hollers, hot broth and dry clothing. Kurt’s family had been waiting for over 4 hours but were still smiling and cheerful. While Jenice helped Kurt refuel, dry off, change clothing and warm up, Nancy help create a makeshift changing room so I could also change. If Nancy was worried about Kurt’s state, she hid it well. I told her he’d had a hard time eating but was going to make it to the finish. We were told that only 17 of the 77 runners had already come through this aid station. Even though the sun was up we left with warm hats, long sleeves and jackets on, still chilled from the river crossing. Even as we climbed we were cold. At the remote 90 mile aid station Kurt scared me. Completely exhausted and low on fuel he started to cry and shiver. I hugged him and reassured him he had this race. We had plenty of time to get to the finish and he was moving well. I encouraged him to drink some water, take some Energybits, drink some Spiz and keep moving. The aid station volunteer was encouraging and told us it had been a rough night for everyone. She offered Kurt more water and a blanket. He drank the water but I made him get up to go. Approaching mile 95, heading for that finish line! Because Kurt had been so far ahead of the cutoffs I hadn’t paid attention to any of the cutoff times. At this station, I asked about the time. I started to calculate our pace and cutoff times and because my watch had died a few miles back asked Kurt for his watch so I could keep track of our pace. I figured if we could maintain a 20 minute/mile pace we would still have time to spare. Kurt was easily keeping a 15 minute/mile pace even when he walked or stopped to stretch. 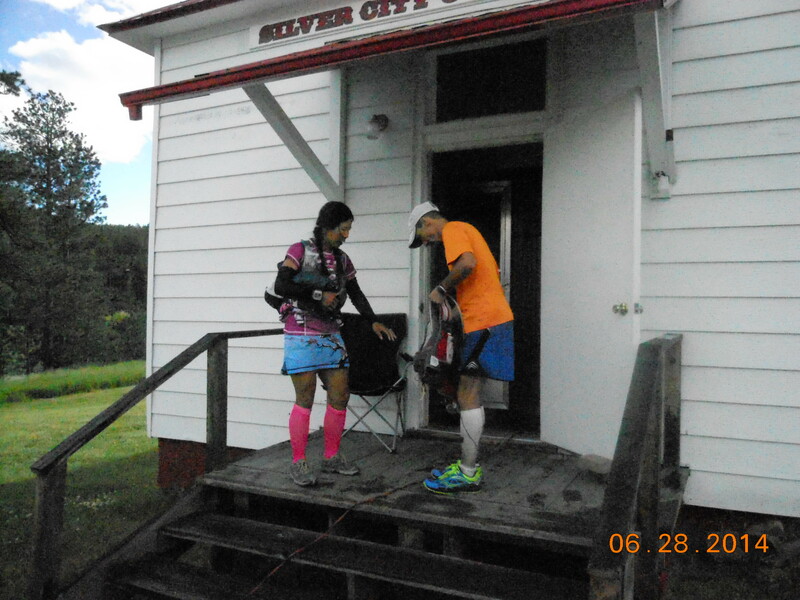 When we saw the crew again at 95 miles the sun was fully up and Kurt was running again but still looked really rough. I warned him that we were approaching the aid station and gave him specific directions to look good (for the sake of his family), keep moving (so he wouldn’t start shivering) and I’d get everything he needed and catch up. I mixed his Spiz, filled my pack, grabbed some chips and ran back to the trail. The volunteer had noticed Kurt stumbling and swaying and told me, “Keep an eye on him.” Jenice and his parents knew he was struggling but knew how tough he was and that he’d make it the final 5 miles. The last 5 miles made us laugh. Not because they were scenic but because the hills were crazy! The fact that Kurt could make fun of the hills was such a great sign. He’d gotten an energy surge knowing that he was going to make it! We’d look up the hill, see a trail marker and just laugh… We’d look down the hill, see a trail marker and I’d ask, “Don’t you remember this?” Kurt claimed it was too muddy outbound for him to even notice how steep it was. It was a good sign he could laugh about the hills, even after 97 miles and exhausted quads. When we finally hit the last mile on a concrete bike path both of us started to get emotional. 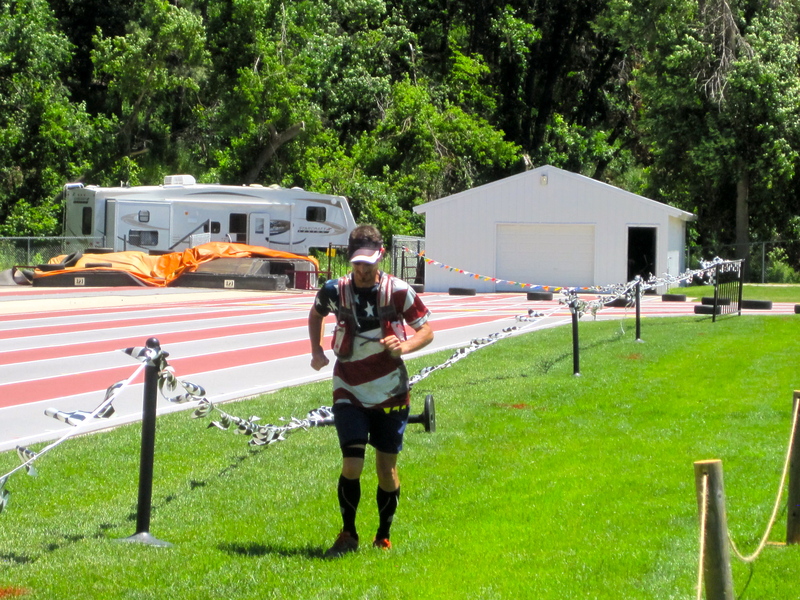 Kurt ran the final ½ mile onto the grass of the infield and across the finish line! He had made it, 101 miles in 30 hours 35 minutes! I was so incredibly proud of him and all he had done to make it across thie finish line. Out of 77 starters only 32 finished (42% finisher rate) and Kurt was the 22nd overall finisher. I feel lucky to have been a part of Kurt’s race, both as a crew person and a pacer. Even just running the final 50 miles I’d say this course is 4 times harder than Leadville and maybe the equivalent of Bighorn. I’m impressed with Kurt’s toughness to keep going with sore feet and upset stomach. The final 40 miles were difficult but he never complained. Watch for Kurt’s GoPro footage of the first half of the race. The mud, water crossings and entertaining narration will give a much better spin on the course. You ran 101 miles, you can lie here as LONG as you like! This course truly is relentless (and stunning)! I spent the first 35 miles gaping at the scenery and the last 15 counting every up and down. I lost count after 15. I’m so happy @tpfeil716 and I got this done. No headlamps, no negative splits but lots of mud (on Terri from the last 2 miles) and lots of fun and sun. I can’t say enough great things about this race. 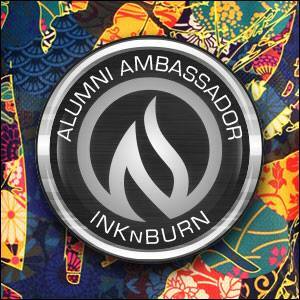 From the excellent communications, caring volunteers, well-stocked aid stations, fun temporary tattoos, thorough course markings, challenging course, and incredible swag, it’s one every ultrarunner should do! (We didn’t make it to the pre-race or awards but I bet it’s all first class too.) My pictures don’t do the scenery justice.